As a business owner, security should be one of your top priorities, and to be successful you’ll need to have a few security measures in place. Burglaries are still very common, and for businesses with on-site equipment or assets, a break-in could be devastating. Most businesses will have digital security in place, but it’s equally important to make sure you’re doing as much as possible to protect your business on a physical level. Here are some security measures that every business should have in place. First and foremost, if you haven’t invested in some high-quality locks then you’re doing burglars a massive favour. Any doors, windows and gates to need to be secured with locks that are strong enough to keep anyone out. It’s recommended that exterior gates should have a lock on both the top and bottom. This is in case an intruder manages to reach over and unlock the top one you still have a backup. If your business is a relatively large property or site then it’s crucial to establish some sort of perimeter. You don’t need to build a fortress, or a castle wall and moat, but a strong perimeter is your first line of defence against any intruders. Depending on the type of site you have there may well be expensive equipment on your property, so in this case you’d require a much higher level of security. Spiked metal fences would prevent anyone from climbing over the top, and be strong enough for them not to be able to cut through. Having on site security is a massive benefit for a number of reasons. Firstly it will give you peace of mind knowing that your business is literally being kept an eye on by qualified professionals, and it also means you aren’t simply relying on other measures (fences etc.) to keep intruders out. With on site security you can maintain your perimeter with patrolling guards. Larger sites may require guards for perimeter patrols, as well as interior guards to keep a close eye on any buildings or outside equipment. If equipment, tools or any materials are left outside then they instantly become an easier target for thieves. Without the supervision of on-site security and the deterrent of their presence, you could easily become a victim of theft or vandalism. Although burglary is a primary security concern, vandalism is still a problem that plagues many business owners. When you consider the variety of different ways someone could vandalise property, and how expensive the outcome would be, it makes taking the right security measures all the more important. Anti-vandal or ‘anti-climb’ paint is commonly used on exterior walls and buildings, this not only prevents intruders gaining access to the site altogether, but also it prevents them from climbing up onto high roofs and other dangerous areas. The dark is an intruder’s best friend, so by installing some lights you put them at a disadvantage. Motion detecting lights will make it difficult for anyone to get close to your property without being lit up, and by installing them high up you will prevent them being damaged. If you have on site security this will be a massive benefit to help them patrol the area more effectively, and make them aware of any potential security risks. Or if any damage has already occurred then they will be able to notice it sooner and contact the police. When you think of security risks that could harm your business, the majority will occur after hours when the property is empty. It’s important to recognise that there is plenty of potential for crime during office hours, which is why building access and gate security can be crucial. 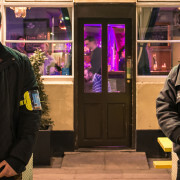 By having someone on the door to monitor the comings and goings it will stop any unwanted parties gaining access, as well as act as a deterrent to potential security risks. The same can be said for gate security on larger sites, as it prevents anyone who isn’t authorised to be on the property entering, and therefore eliminates the risk of theft or damage. All of the above mentioned security measures apply to a wide-range of different businesses whether it’s a large organisation or a small business, as losses caused by theft or damage have the potential to ruin a company. Putting security measures in place give you peace of mind knowing that your business is safe when you’re not around. If you require any information about our services and what we can do for you, or have any other enquiries then don’t hesitate to contact us via 0203 246 0094 or email us at office@closecircuit.co.uk.